Lactate Assay Kits | Cell Biolabs, Inc.
Lactic acid is an alpha hydroxyl acid that can ionize a carboxyl proton to yield two isomers of the lactate ion: L-lactate and D-lactate. Lactate is also formed during fermentation through the breakdown of pyruvate by lactate dehydrogenase. Lactate is found in the blood at varying concentrations, dependent on the level of exercise. It is also found in the brain, where it is thought to serve as an energy source. Lactic acid is found naturally in foods such as cheese, milk, and bread. 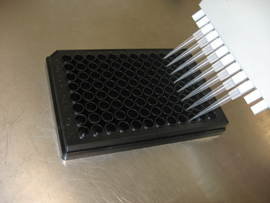 Our Lactate Assay Kit measures L-lactate in biological samples. Lactate is first oxidized by lactate oxidase, yielding pyruvate and hydrogen peroxide. The hydrogen peroxide released from this reaction is specifically detected by either a colorimetric or fluorometric probe in a 1:1 ratio. Lactate levels in unknown samples are determined based on a lactate standard curve.